Pegged to finish last in their division in 2017, the New York Jets performed admirably for head coach Todd Bowles despite just five wins. With a recent contract extension for Bowles in place, the Jets front office could go a long way in helping their head coach with on field talent at many spots across the board that need an upgrade. General manager Mike Maccagnan will have an ability to make value-based decisions in the 2018 NFL Draft rather than draft by need as they were aggressive during free agency to fill those needs. While they may have hit on draft picks on defense recently, their inability to bring in quality quarterback play from draft pick Bryce Petty and the decision to not get Christian Hackenberg on the field has left them in a bit of a troubled spot at the most important position in team sports. They signed Teddy Bridgewater to a one-year deal to compete with Josh McCown this fall, they also executed a trade with the Indianapolis Colts in March to secure the No. 3 overall pick, sending their No. 6 pick and two second-rounders in exchange. Immediate reactions point to them selecting one of the top signal-callers available in this draft class despite both teams picking ahead of them that could also select a quarterback. Aside from quarterback, the Jets have other areas of need including protecting whoever is behind center in 2018 along the offensive line. Maccagnan traded back three times during last year’s draft, so it wouldn’t come as a surprise for him to do so this year as there are a bevy of interior offensive lineman options they could covet. 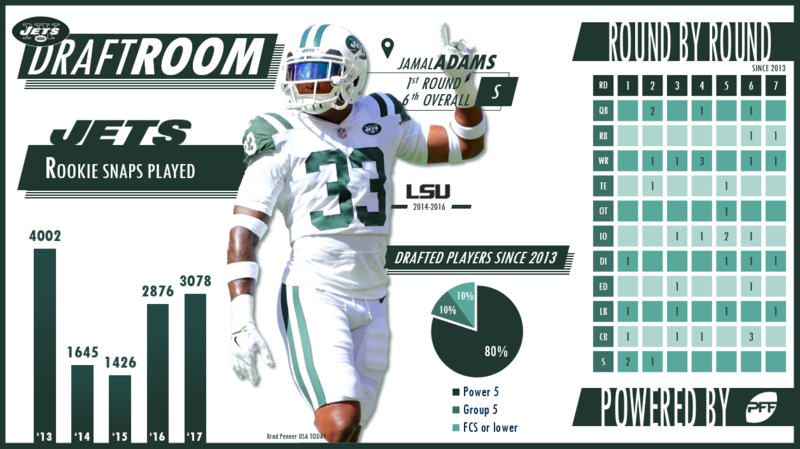 New York’s secondary is tight at safety, selecting their safety duo of Marcus Maye and Jamal Adams in last year’s draft, but even with the addition of Trumaine Johnson from the Los Angeles Rams, could use another viable option in the slot. Using our Wins Above Replacement (WAR – roughly the number of wins a team gets from replacing an off-the-street player with the player of interest) metric as a model, Adams was worth a very respectable 0.5 WAR during his first year with the team. Speaking to the aforementioned trouble in finding quality quarterback play, between Petty and former Jets QB Geno Smith, the duo combined for nearly 4.0 wins below replacement so far during their careers. With no regular season snaps to his name, Hackenberg obviously has generated 0.0 WAR in his time during the year. How Have the Jets’ Draft Classes Stacked Up League Wide 2013-2017? Pick seemed like overkill at the time, but he’s become the best player on the Jets’ defensive front, generating 15 sacks, 47 quarterback hits, 92 hurries and 109 stops in just three years. Before being traded to the Seahawks, Richardson graded above an 81.6 in each of his four seasons with the Jets. Adams had a fine rookie season, generating 35 stops, eight pressures and four pass breakups. Forced 22 missed tackles as a rookie on just 105 touches as a rookie. His 2-1 career interception-to-touchdown ratio would make quarterbacks from the 70’s blush. Has completed just 53.1 percent of his 245 career passes as well. Was the second-lowest-graded linebacker in the league in 2017. Switched teams for the second time this offseason. Averaged only 0.39 yards per route run so far in his career. Injuries haven’t been kind to Smith, but he’s caught just 10-of-29 career targets.